For the first time in twenty-four years and only the second time in their history, two masterpieces of early Netherlandish painting commissioned by the Carthusian monk Jan Vos will be reunited in a special exhibition at The Frick Collection. These works — the Frick’s Virgin and Child with St. Barbara, St. Elizabeth, and Jan Vos, by Jan van Eyck and completed by his workshop, and The Virgin and Child with St. Barbara and Jan Vos (known as the Exeter Virgin, after its first recorded owner), painted by Petrus Christus and now in the Gemäldegalerie, Berlin — will be shown with a selection of objects that place them in the rich monastic context for which they were created. The exhibition pays tribute to Vos as a patron and offers insight into the role such images played in shaping monastic life in fifteenth-century Bruges. 'The Charterhouse of Bruges: Jan van Eyck, Petrus Christus, and Jan Vos' will be on view in the museum’s Cabinet Gallery from September 18, 2018 to January 13, 2019 and is organized by Emma Capron, the Frick’s 2016–18 Anne L. Poulet Curatorial Fellow. In conjunction with the exhibition, Colombia University New York organizes the workshop ‘Making Art, Making Meaning in Fifteenth-Century Flanders’ on October 19. 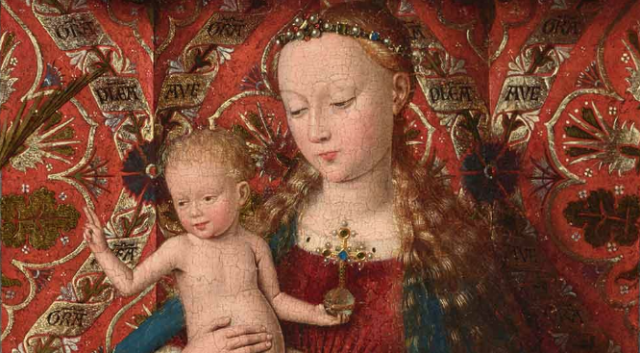 The workshop will examine the making and meaning of art in fifteenth-century Flanders, with the aim of considering the context of Jan van Eyck’s Virgin and Child with St. Barbara, St. Elizabeth, and Jan Vos. Speakers: Maryan Ainsworth, Till-Holger Borchert, Emma Capron, Jan Dumolyn, Ingrid Falque, David Freedberg, Susan Jones and Walter Prevenier.